Finnan was born in the Janesboro area of Limerick City, but moved to Chelmsford, England at a young age. He began his career with non-league Welling United, turning professional with Birmingham City in 1995, but, after only a handful of appearances, he was soon on his way to Notts County. There he established himself in the first team and attracted a considerable amount of interest from higher division teams. After some strong showings for County in 1997-98, Fulham paid £600,000 for his services in November 1998. He became an instant regular at Craven Cottage and a fans' favourite. With Fulham he won the old Second Division championship in 1999 and then the First Division in 2001. Finnan had an impressive first season in the Premiership, helping Fulham qualify for the UEFA Intertoto Cup and being voted into the 2001-02 PFA team of the year by his fellow professionals. Fulham then went on to win the Intertoto Cup, giving Finnan his first taste of European football. In the summer of 2003 Finnan found himself courted by many of England's top clubs and eventually joined Liverpool for a fee of €4.9m. Finnan's first season at Anfield was disrupted by a succession of injuries. However, the campaign ended on a high as Liverpool clinched fourth place and a UEFA Champions League qualifying spot. During the 2004-05 season with Liverpool, he established himself as the first choice right back and a firm fans' favourite.This successful season saw him play in the Carling Cup final which Liverpool lost 3-2 to Chelsea.Finnan also started in the UEFA Champions League final against AC Milan, which the team went on to win. Unfortunately he picked up an injury and was substituted at half time. He had a highly successfully 2005-2006 season in which he was a start performer for Liverpool and was consistent throughout the season. At the end of the season Liverpool won the FA Cup and Finnan added another medal to his collection. Finnan played for Liverpool as first choice right back for the 2006-2007 season despite heavy competition from newly arrived team-mate Alvaro Arbeloa. The season was a very successful one for him as he was very consistent throughout the season and many fans considered him to be one of their top-performers as evident through the high amounts of vote he collected in a poll in the official Liverpool website. He participated in the 2007 UEFA Champions League Final and was later substituted after 88 minutes for Arbeloa. Liverpool went on to lose the game 2-1. On July 23 Finnan agreed a new 3 year contract to remain with Liverpool. On August the 19th Finnan was involved in a penalty decision in which Chelsea's Florent Malouda went to ground, not one Chelsea player appealed for a penalty, however referee Rob Styles gave a penalty because he thought Finnan had fouled him. Video replays later showed that there was no illegal contact between the players. The final score was Liverpool 1 - 1 Chelsea when Frank Lampard converted the penalty to level with Fernando Torres' 16th minute goal. Steve made it into the top 100 Liverpool appearances of all time when he came on as substitute in the 4-0 victory over Toulouse on 28th August 2007. On transfer deadline day, 1 September 2008, Finnan joined Spanish side Espanyol signing a 2 year deal for an undisclosed fee.Finnan has suffered niggling injuries since his arrival at Espanyol. Espanyol coach, Mané, has stated that Finnan is still a key member of the squad.Despite this, there have been reports linking Finnan with Tottenham Hotspur and Hull City and Newcastle. A Republic of Ireland Under-21 international, Finnan stepped up to the senior side in 2000 against Greece, filling in for the injured Stephen Carr.Although he was raised in England, Finnan is very proud of his Irish nationality and he has alluded to this fact in many interviews. 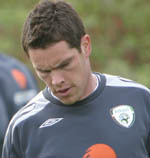 He cemented his place in the Irish starting XI towards the end of qualification for the 2002 FIFA World Cup, supplying the cross for Jason McAteer to score the only goal in the crucial 1-0 home win against the Netherlands in September 2001.He appeared in all four of Ireland's games in South Korea/Japan, but injury disrupted his participation in the unsuccessful attempt to reach the Euro 2004 finals.He was a regular choice in the 2006 World Cup qualification games. Last 10 games in which Steven Finnan scored. Games in which Steven Finnan was a Substitute.